I’m not one to jump on the commentary bandwagon of everything that flies through the blogosphere (ok, maybe a little bit), but this one seems pretty significant. The amount of flack this is stirring up is noteworthy (perhaps rightly so), because it’s causing a lot of people to ask some tough questions and have some very different kinds of conversations. The issue at issue here is the book Pagan Christianity? Exploring the Roots of Our Church Practices by Frank Viola and George Barna. The contention of the book is that apparently nearly everything that is the Church today is contrary to New Testament teaching. 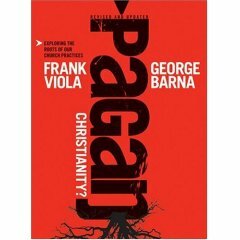 Viola argues that things like professional ministry (“pastors”) and church buildings are not only against the biblical presentation of “church,” but that they are actually an adopting of “pagan” ideas and practices into the church. Let me quickly say that I have not read the book (yet), so I am not commenting here as a reader and reviewer, but as an observer of the ripples in the pool. The New Testament knows nothing of professional “pastors” or other leadership (cf. John Piper’s recent book). What we see in Acts and the Epistles is a plurality of eldership (overseers) in local churches in which there are no titles. There was no papal or CEO, top-down leadership model in use. Terms like apostle, elder, prophet, teacher, overseer were descriptions of gifts and functions, not titles or offices. “Pastor” is actually the term used least in the NT, and should be translated “shepherd.” The credentials for leadership (e.g. Acts 6:3, 1 Timothy 3:1-13, Titus 1:5-9) were being full of the Spirit, having wisdom and solid character, and being appointed by an apostolic leader (among other things). The NT knows nothing of leaders being called “priests” or functioning in persona christi. It teaches that we are all a priesthood unto God (see 1 Peter 2:9). The Lord’s Supper was a part of the Passover celebration and then part of a Christian “love feast,” not a liturgical re-sacrificing of Christ or a bland, symbolic ritual with tiny crackers and grape juice. The NT knows nothing of the so-called “clergy-laity” distinction. The modern era only further refined this paradigm into a lecturer-listener, performer-observer way of doing church. The scriptural purpose of the leadership gifts of the church was to equip the saints so that they would all be about doing the work of the ministry (Ephesians 4:11-13). The NT knows nothing of “church” buildings. Not until Emperor Constantine made Christianity favored and legal in the fourth century A.D. were buildings constructed. In Jerusalem in the first century, the believers met house to house (small groups) and in the temple (large group) [see Acts 2:46, 5:42, 8:3, 20:20]. Once the gospel got outside of Jerusalem, there was no temple for meeting, and The Way was generally in and out of persecution. “Church” meetings were done in homes and small venues. I am sure that the book hits on these issues and probably many more. To me, the issue is not whether these things are historically true (as some are debating), but what are we to do with them? Are we supposed to function just like the first century church? How did our current church practices come to be? Are they “pagan”? And if so… so what? How are we supposed to “do church” in the right now? Read Is the Pastorate Pagan? from Out of Ur (my favorite blog). Read Dan Wilt’s thoughts on the book. Josh Brown has some mixed thoughts of Viola’s message and presentation here. Get some things right from the horse’s (umm, Frank’s) mouth at Present Testimony ministry and here.